The Bermuda Triangle is a mysterious region of the Caribbean which has supposedly claimed multitudes of ships and planes over the years. What happened to all those planes, boats and their crews? Were they sucked down by a huge whirlpool, sunk by pirates, or beamed up by mischievous aliens? Whatever the reason, the phenomenon continues to captivate conspiracy nuts and sci-fi fanatics in equal measure, and it’s the theme which has captivated NextGen Gaming enough for them to launch their own Bermuda Triangle-themed game, The Bermuda Mysteries. 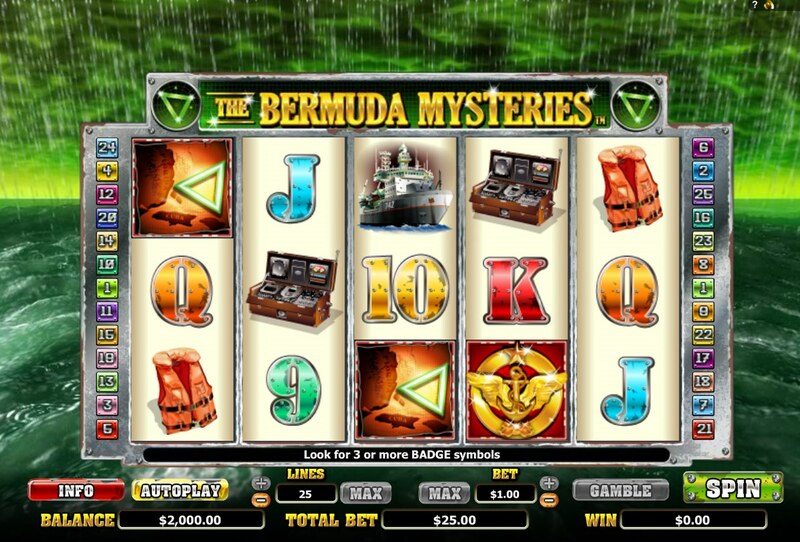 In keeping with some of NextGen’s other online slots offerings, The Bermuda Mysteries comes with a friendly betting range from $0.01 to $2.00 on its 5 reel, 25 pay-line set-up, with lots of nice graphics and slick animation on its winning combos. In the background, an eerie rain swept ocean scene moves whenever you hit a winning combo. It’s like something out of The Matrix without the high-kicks and bad acting. Elsewhere on the reels, the symbols include a fighter jet that speeds towards you when it forms a winning combination. Five of those across the reels pays out a jackpot of 5000x your line bet, while a WWII frigate, radar equipment and life jackets, plus the regular 10-through-Ace symbols, make up the remaining symbols. The Pilot symbol is the Wild, and he only appears on reels 2, 3 and 4, substituting for all symbols other than the Scattered Map and Badge. All Wild wins are doubled. You can win 12 free spins with three or more Scattered Badges. During the free spins, a Radar icon is added to the fifth reel. Each radar that appears increases the multiplier on your wins by 1. Three Map Scatters anywhere triggers the game’s other bonus, essentially a Pick Me Bonus called the Rescue Bonus feature. Your plane’s radar will sweep the area to find lost planes or ships. Pick up either and you’ll win prizes. There are also compasses, whirlpools and flying saucers to find too. The round can be triggered during free spins, meaning you can bag a doubly big win if you play your slots right. 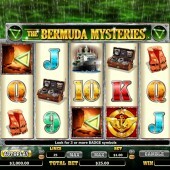 With some nice animation, an attempt at making the multipliers on the free spins a little more attractive, and decent wins potentially up for grabs, The Bermuda Mysteries certainly offers something for everyone. If you enjoyed the sci-fi weirdness of Area 51-themed games like OpenBet’s Alien Autopsy or Playtech’s own take on the UFO phenomenon, Alien Hunter, you should get a kick out of this.